Most people have seen Twister, but how many people know the facts behind the movie? Tornadoes are one of natures greatest forces, a phenomenon that is destructive and beautiful. 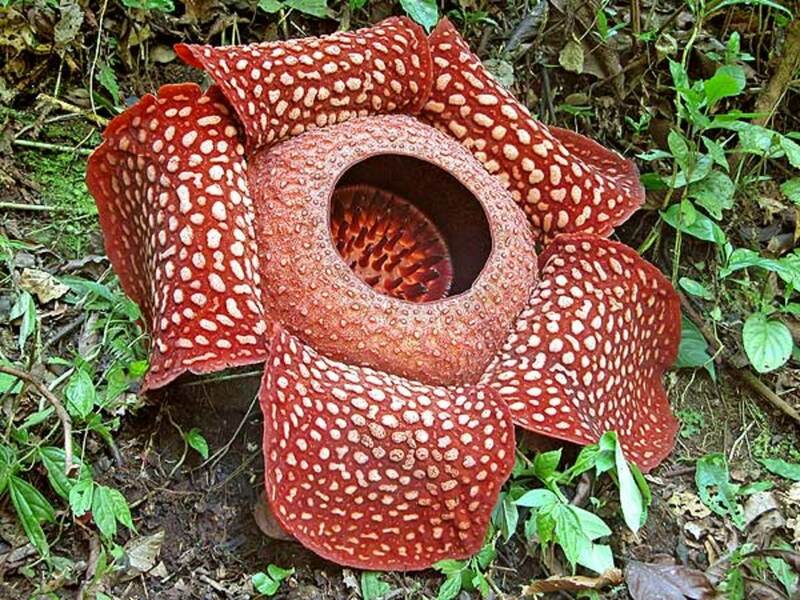 The quote, "science kills beauty", does not apply to these interesting happenings. A tornado is a violent, rotating funnel shaped cloud that extends from a heavy thundercloud to the ground. These storms include winds that range from 30 miles per hour to over 300. While many tornadoes are visible to the naked eye, some are disguised by the surrounding clouds and rain. Tornadoes can cause damage to buildings, trees, vehicles and entire cities. These violent storms can cause damage as large as a mile wide and 50 miles long. When the warm, wet air from the Gulf of Mexico meets the cool, dry air coming from Canada, a tornado forms. They generally occur after a thunderstorm and are produced from thunderclouds, called Cumulonimbus clouds. As the wind changes direction and the wind speed increases, a horizontal spinning occurs in the lower atmosphere. This part of the cycle is invisible to the eye. When the rising air within the updrafts changes the horizontal spinning to vertical, a tornado is formed. The area of vertical spinning can be as large as six miles wide. For a tornado to form, there must be a thunderstorm created by an unstable atmosphere. An unstable atmosphere occurs when temperature decreases rapidly with height. 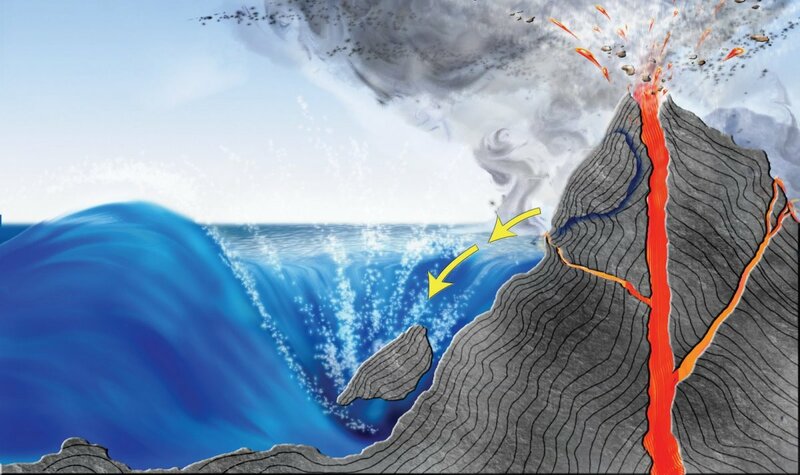 It can also happen when a layer of dry air overlaps moist air near the surface of the earth. The most violent tornadoes usually come from supercell thunderstorms, or storms that last for a long time and have a continuous updraft of rotating air. These storms not only produce tornadoes, but hail the size of softballs. What Kinds of Tornadoes are There? Supercell tornadoes - Formed from supercell thunderstorms these tornadoes are typically the most violent and destructive, producing extreme winds and damaging hail. They can appear as a rotating funnel or as a large wedge. 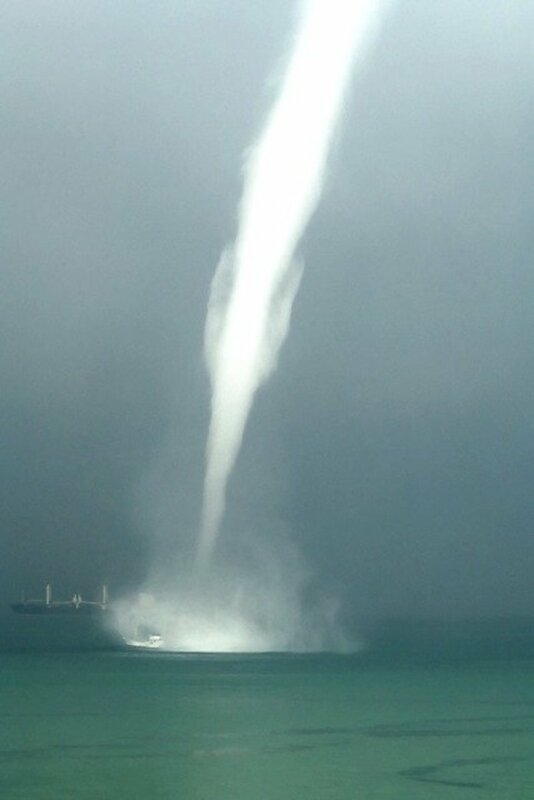 Waterspout - Unlike a typical tornado, these form over large bodies of tropical water. They are not very wide and are made of fresh water condensation. 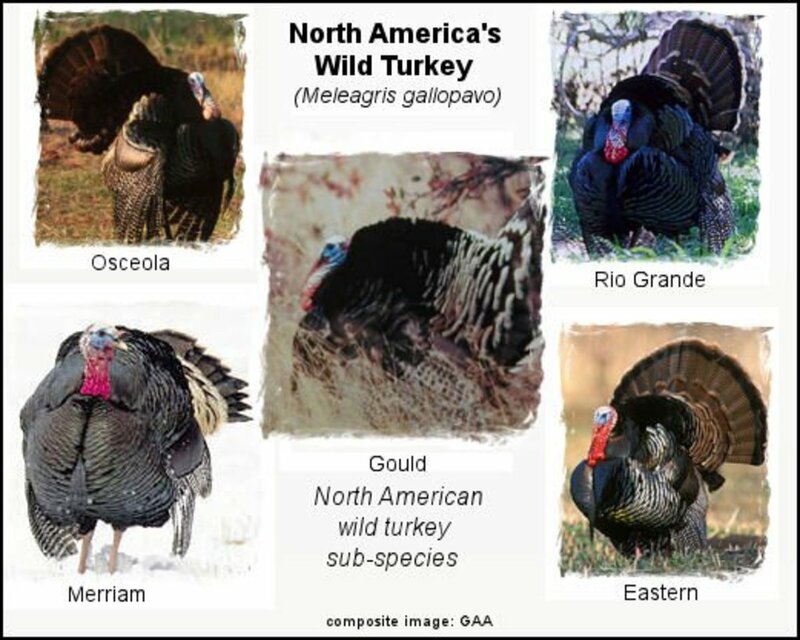 These usually disappear once they hit land, not causing much damage. Landspout - These tornadoes are considered weak compared to a supercell tornado. These are not associated with a mesocyclone or wall cloud. Gustnado - These short lived phenomenons occur at the gust front of a thunderstorm. They don't last long and may appear as rotating debris without any rotating movement in the clouds above. The United States sees four times the amount of tornadoes than Europe each year, with approximately 1,200 confirmed tornadoes. Tornado season rolls into full swing in March and can last until July depending on the region. 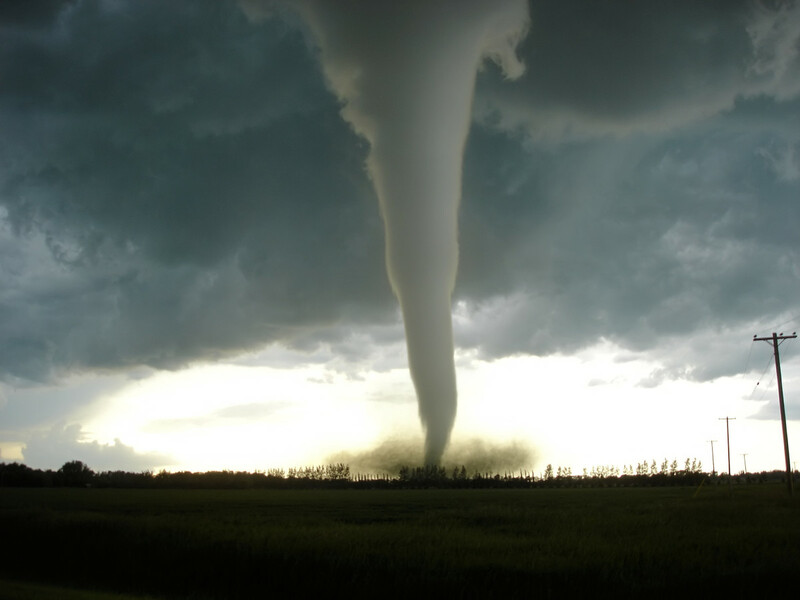 In the Southern region, it is typical for tornadoes to occur from March to May. Near the Southern Plains, tornadoes are most common from May to June. 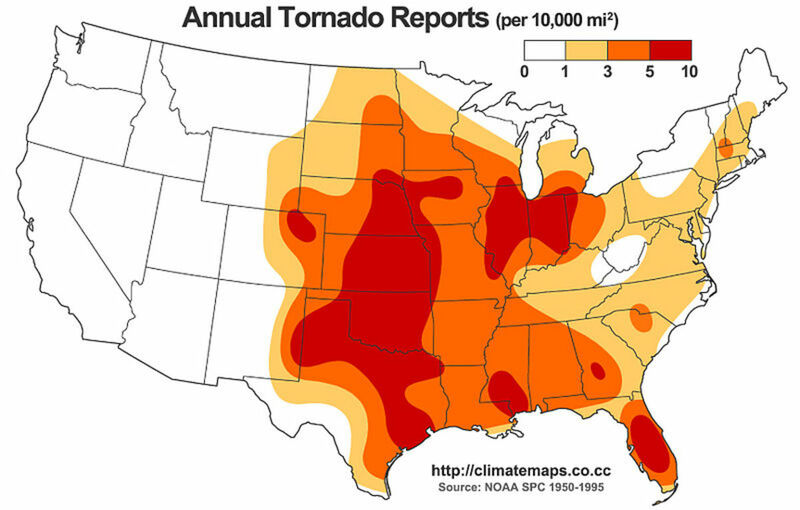 The Midwest and Northern States experience tornadoes later in the year, from June to July. Typically, thunderstorms capable of producing a tornado are seen during the hottest part of the day, from 4 to 7PM. Everyone knows Tornado Alley is the most common area for tornadoes to form. However, Florida is extremely susceptible to tornadoes due to their frequent thunderstorms. Tornado Alley includes Northern parts of Texas, Oklahoma, Kansas, Nebraska, Iowa, the Eastern side of Colorado, a tip of South Dakota and Southern part of Minnesota. However, all states are at some risk of experiencing a tornado. For years people have said that the sky turns green before a tornado. This, however, is mostly a myth. Although the sky can turn green before a tornado, it is not an indicator of a tornado. With these signs, you should take caution and get to safe place. Tornadoes are not to be played with and can move very rapidly and cause immense destruction. You should discuss what to in the scenario with your family. Pick a common place in the house to gather. Avoid rooms with a lot of windows and if possible, be in the basement. If you don't have a basement, gather in a hallway, bathroom or closet in the most interior part of the home, on the lowest level. If you have a sturdy table, take cover under it. Also, cover your body with something soft such as a pillow, mattress or heavy blanket. This will protect you from flying debris. Do not take cover under heavy objects on upper floors such as bathtubs, pianos and refrigerators. These objects can crash through the floor if the tornado is violent. Always cover your head with something, even if it is just your hands. 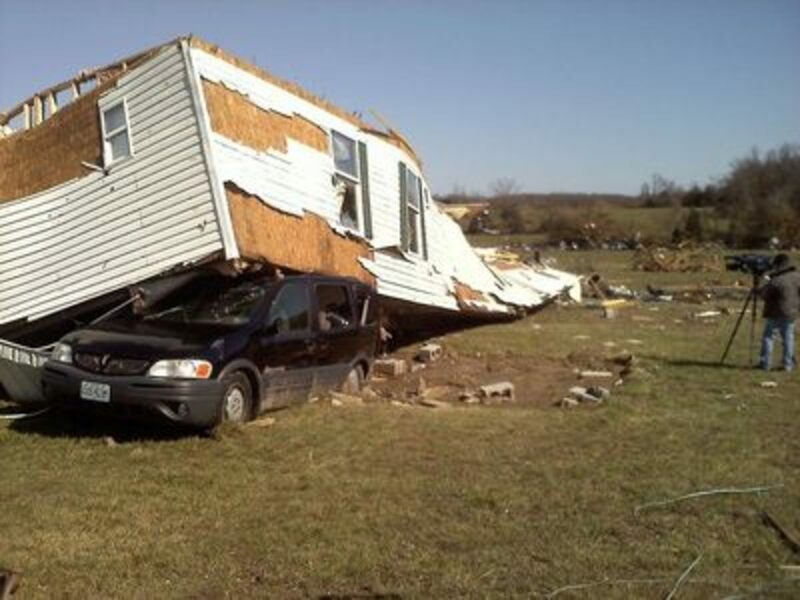 Because of the structure of mobile homes, you should immediately leave in case of a tornado. These homes cannot withstand the forces of a tornado and can easily be ripped to shreds or turned over in violent storms. Instead, find a neighbor or close by building with a basement or safe interior room. If you see a tornado or hear a tornado warning while you are in a vehicle you should stop the vehicle and get out. Do not hide under the car as cars, trucks and buses can be lifted off the ground during a tornado. Follow the guide to outdoor protection, below. Do not try to drive faster than the tornado as they are unpredictable and could strike your vehicle at any time. Find the lowest area of ground that you can, such as gully or ditch. Lie down flat. Avoid areas with trees or nearby vehicles. Protect your head with whatever is available, even your arms and hands. These large building may seem safe, but can be extremely dangerous in the case of a violent tornado. Their roofs are held on by the wall structure and they will collapse under the pressure of a tornado. If you cannot get to lower ground or away from the building stay under a stable counter or door frame to protect yourself from debris. Avoid windows. Tornadoes are categorized by how powerful and destructive they are based on wind speed. The Enhanced Fujita scale was developed by Dr. Ted Fujita, a severe storm researcher who originally named it the Fujita Tornado Scale. In 2007, the EF scaled was officially adopted by the National Weather Service. Scientist use this scale to rate how dangerous and powerful a tornado is, ranging from the least dangerous (EF0) to the most dangerous (EF5). 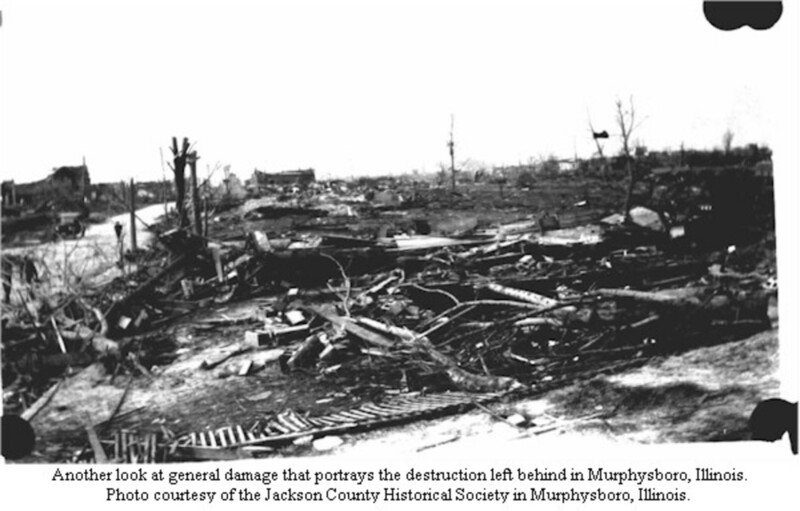 On March 18, 1925 the most destructive tornado in history hit the United States causing 695 deaths and over a 100 injuries. It was called the Tri-State Tornado. 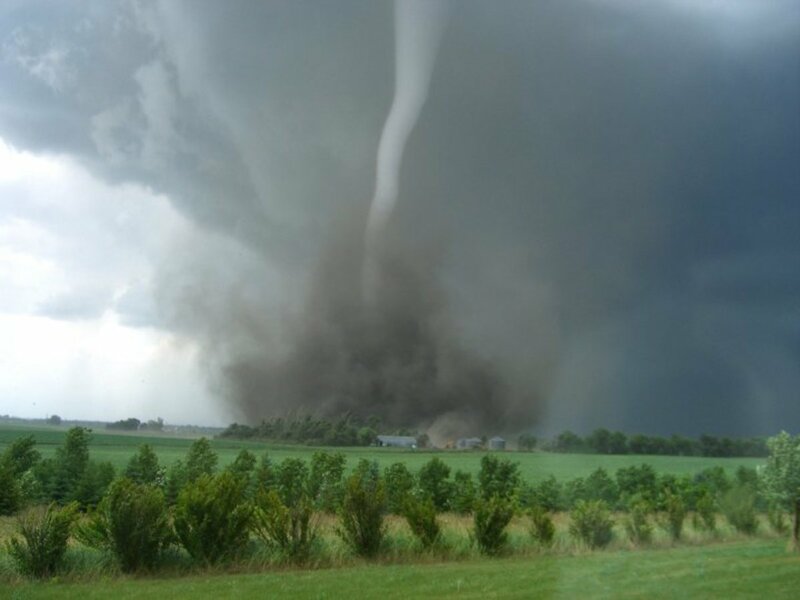 This tornado lasted for 3.5 hours and rode straight through Missouri, Illinois and Indiana. It received the title of deadliest tornado as well as the longest tracked tornado in the world. Taking out whole towns at a time, it was over a mile wide. Although the initial forecast for the day was nothing out of the ordinary, around 1PM, the violent twister started near Ellington, Missouri, killing one farmer. 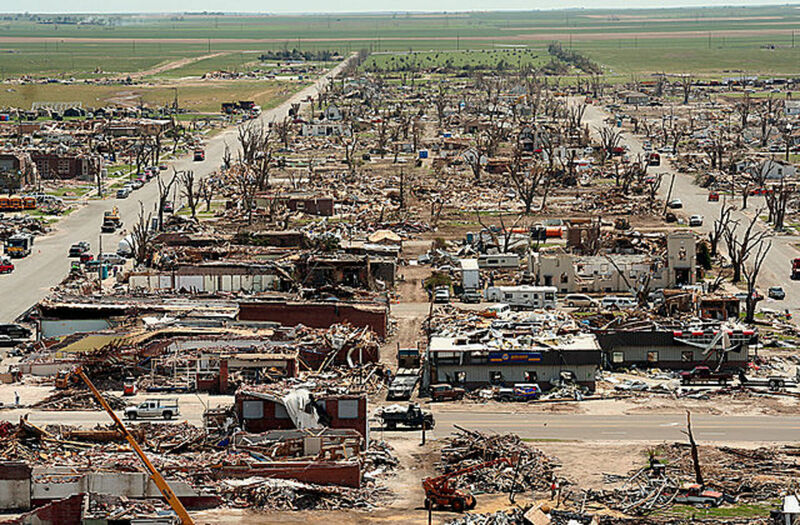 In all, the F5 tornado flattened over 15,000 homes that day. It killed 243 people in one single town. Although there are no photos of twister itself, many pictures of the destruction remain today. They are devastating photos of ruined lives and towns that had been obliterated. Would You Go on a Storm Chasing Tour? If you are interested and intrigued by these wonders of nature, there are companies that allow you safe and secure viewing tours. Companies such as Tempest Tours, guarantee the experience of a lifetime. You will chase severe storms and possibly see a tornado. You will also get to tour weather facilities and historical locations such as Mount Rushmore. Tours are scheduled during tornado season, giving you a fair chance at seeing one of these phenomenons from a safe distance. Most chases occur during peak times through Tornado Alley and last from one week to two weeks. Most tours with any company range from $2000 to $5000 per person, depending on length of tour and extras. Tours include all stay and travel expenses during the tour. However, you are required to provide your own money for food and trinkets. Take a friend or family member who you are willing to share a room with and you will typically get a discount. All tour companies offer multiple tours throughout tornado season, giving the opportunity to see different storms in different locations, at your convenience. Guides go through extensive safety training and orientation, putting your safety first. Thank you for the comment and for reading! I would be happy to check out your hubs and follow you! Have a wonderful day! I really enjoyed this hub. A true piece of natural-creativity. Very helpful, professional and delightful to read. I live in "Tornado Alley," the section of the south that stretches from Texas through Mississippi and on through my hometown, Hamilton, Alabama, and into Georgia, so this hub is very sobering and helpful. Educational, important and interesting hub about tornadoes. Those who have never experienced a tornado are fascinated and horrified at the same time. I've been through several bad hurricanes but never a tornado! Tornadoes are among my biggest fears. But knowledge is power. Thanks for the ammunition. We rarely get them this far North but they are amazing and occasionlaly destructive. Thanks for stopping by! Wow, thorough and comprehensive! We don't get such rough tropical storms here because the temperature of the air and its quality is not so extreme, but I can imagine the need for immediate protection should it strike. Thanks for sharing! Me too! I am saving up because I am determined to go, maybe not this year, but next for sure. It's on my bucket list. I could totally be into chasing storms. Interesting to see that travel companies provide these kinds of trips.